Inside the classroom-turned-office of the Asheville Design Center at Randolph Learning Center, there appear to be dozens of projects in some stage of action—sketches for a park mural are taped to a dry erase board, maps of the Interstate-26 connector alternatives are pinned to the wall, and intriguing drawings of various landscape projects invite a closer look. The place is a mini factory of design possibilities, put on paper by a host of landscape designers, architects, planners, and artists. But the backstories to these illustrations and schematics are driven by communities, not individual clients. The projects reflect public ideas dreamt up, pondered, and critiqued by anyone from a retiree to a teacher to a kindergartner. “Design is just problem-solving. First you have to understand the problem,” says Chris Joyell, executive director of the center, which links volunteer design experts with community members to collaborate on solutions to a host of challenges, whether it’s revitalizing a downtown corridor or building a playground for an underserved neighborhood. The approach is forward thinking in that with any given goal, the center takes the design process to the people—residents, neighbors, kids, anyone with a stake in the changes—to help shape a plan, because as Joyell puts it, no one knows more about what a community needs than the people who live there. All the projects start with charettes, when the experts listen and the public voices what they want for their surroundings. Because of this approach, Joyell is as well-versed in the needs of Bryson City as those of Hall Fletcher Elementary School in his own neighborhood of West Asheville. The nonprofit center’s first project was ambitious. In 2006, funded by a grant from the American Institute of Architects, volunteers sought to devise a plan for the controversial I-26 connector through Asheville. The goal was to review and work with the proposals offered by the Department of Transportation and develop a community-influenced design alternative. Rather than just looking at the road, the public was challenged to think about the bridge’s impact on the adjacent River Arts District. Since then, the center has conducted site studies for the proposed Performance Center in downtown Asheville, while providing revitalization options for the neighboring historic African-American business district called The Block. In 2011, the center arranged a 10-week design-build studio program that allowed students from three universities to work with the Burton Street community in West Asheville to build a pavilion from recycled materials. In a time when budgets and funding seem far too lean to support creative vision, the design center fills a need many wouldn’t otherwise be able to afford. Each architect, planner, designer, or artist donates their time and services. To date, these volunteers have logged thousands of hours valued at more than $1.5 million. The design center has collaborated with chambers of commerce and organizations such as HandMade in America’s Small Town Revitalization Program to provide plans. Robbinsville and Bryson City are just two examples of cities that have worked with ADC. “These are small towns that have so much going for them as far as location and natural resources, but they may be challenged when it comes to financial resources,” Joyell explains. Here are a few projects in the works that communities are bringing to life. When landscape architect Joel Osgood first met with the students, parents, faculty, and staff at Hall Fletcher to gather input for a new outdoor learning environment, he learned a few things himself. As a designer of high-end resorts, he was more accustomed to playgrounds for golfers than the 12-and-younger set. Lesson No. 1: Swings are sacred. The kids let their imaginations roam, but their plans never exclude swings. Lesson No. 2: The sky is the limit, literally. One imaginative student asked Osgood to create a spot where he could levitate. Looking at the current plan, it may be one of the few requests that couldn’t be honored. Osgood’s design for the learning environment, which is still going through the feedback phase, is a creative blend of lofty spaces and ideas. There’s a small tree house to please the kids and a community orchard designed to encourage after-school campus visits. Necessities such grading and paths to allow the school’s physically disabled students to enjoy the space were also incorporated. It will be a vast transformation of the current forlorn playscape encircled by a chain-link fence. The school’s façade is in store for a makeover too. The uninspiring 1970s brick box of a facility will be adorned with a mural created by fourth-graders with the help of local artist Ian Wilkinson, whose work is featured in the Lexington Avenue Gateway murals. What will make the space a learning environment, not just a souped-up jungle gym, is that curriculum for this math and science charter school will be integrated into many of its features. The focal points will be two domes built on principles used by the 19th-century architect Rafael Guastavino, famous locally for the Basilica of St. Lawrence and its freestanding elliptical dome. The hope is that students will have the chance to make ceramic tiles to form these outdoor classrooms and explore the gravity-defying building technique that still baffles architects. Also on the drawing board are a kinetic carousel that powers a water feature, amphitheater seating, and a water play table. There’s more at work behind this revamp than aesthetics and recess: The design reflects a new energy inside the school. Dr. Gordon Grant, in his second year as principal, sees this as an opportunity to engage the surrounding neighborhood and build support for a school battling tough issues, such as trailing reading scores and poverty. Eighty percent of students at Hall Fletcher receive free or reduced lunches. Both are issues that can’t be fully addressed without outside support. The first wave of back-up is coming from a local chapter of the Yale Club, spearheaded by member Conner Fay. Already, preparations for change have begun with volunteers from the club, PTA members, and students spending two weekends priming a nondescript breezeway that will be spruced up with a vibrant mural. At the end of an inconspicuous side lane that branches from Everett Street, Bryson City hides a rare asset: an island park with the potential to be an urban oasis. The tranquil Tuckasegee flows around the clump of land and through the center of town. But for as long as folks can remember, the white-water thrills on the Nantahala River, just 12 miles west on U.S. 19/74, have stolen the limelight. Unlike other cities across the country that have paired waterways with greenways, Bryson City never cashed in on the potential of the Tuck. Great Smoky Mountains National Park and Nantahala National Forest sit at the town’s doorstep, making the river an ideal link to the region’s reputation as an outdoor recreation mecca. Yet, along most of the river, buildings face away from the water and there are no designated recreational access points. Residents recognized the problem. 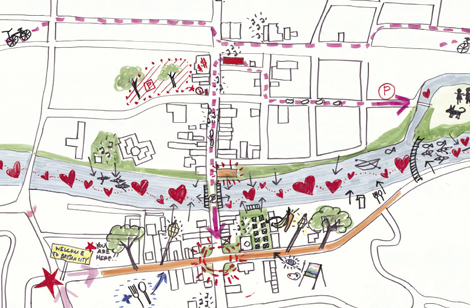 In 2011, a plan to embrace the river came out as a key goal when a team from HandMade in America’s Small Town Revitalization Program, in collaboration with ADC, interviewed residents, says Judi Jetson, director of the small towns initiative. The designers came back with a mix of ambitious sketches of a river porch with seating and access to a greenway that hugs the waterway’s north bank, as well as easily achievable solutions such as improved signage. They knew visitors and residents would find it more enjoyable to walk the city along a remodeled Everett Street Bridge, taking it from a stark cement thruway to a pedestrian park with benches and plantings. Attractive signage directing folks to the concealed Island Park and a welcoming arbor entrance are small but important upgrades in the plan. All the enhancements won’t just be for the sake of a pretty scene. The city is planning to use the park as a venue for the Freestyle Kayaking World Championship in September 2013, which will host expert boaters and thousands of spectators. The hope is that crowds will get a taste of the new Bryson City and recognize its greater role as a hub for outdoor recreation. Ask anyone if they’ve visited Graham County and they’re likely to tell you about catching bass on Lake Santeetlah, trekking Joyce Kilmer Memorial Forest, or tapping their feet during an old-time concert at Stecoah Valley Cultural Center. They probably won’t mention a stop in Robbinsville. Brenda Artiss remembers the vibrancy of the place where she grew up. Now, the revitalization and infrastructure committee chair of the Graham Revitalization Economic Action Team (GREAT), she recalls when downtown included a host of shops, including Snider’s Department store, restaurants, and a movie theater. In those days, logging, construction, and tobacco farming sustained the economy. Today, many storefronts are empty and a bypass does just what the name implies—makes it easy to bypass the rural town of fewer than 1,000 folks. And that’s the trouble: Thousands of people pass through on their way to the alluring outdoor spots, but don’t see a reason to stop in town. “We have numerous natural resources, beautiful countryside, and our town needs to reflect that,” Artiss says. The community, town council, and GREAT are trying to restore the luster. Since 2009, Robbinsville has been working with the Rural Center’s North Carolina Small Towns Economic Prosperity Program to identify its strengths and weaknesses and craft a plan for the future. With funds from a grant by the Golden Leaf Foundation, David Salveson of the Center for Sustainable Community Design at UNC-Chapel Hill, commissioned Asheville Design Center to reimagine the entire town following directions from its residents. Out of two weekends of discussions, the design teams came up with greenways, streetscape enhancements, pocket parks, and a welcome center to anchor downtown. Designed by Asheville architect Michael McDonough, the welcome center would make use of an existing stone façade and bridge the divide between the lower level Ford Street and upper Main Street with steps leading to a pavilion and information station. A structure modeled after a fire tower will house an elevator.